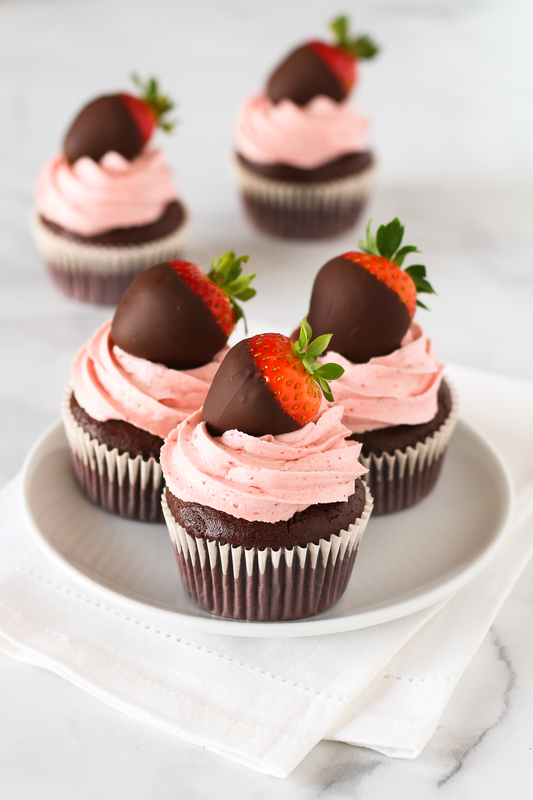 Chocolate cupcakes with a fluffy strawberry buttercream, topped with a chocolate covered strawberry. 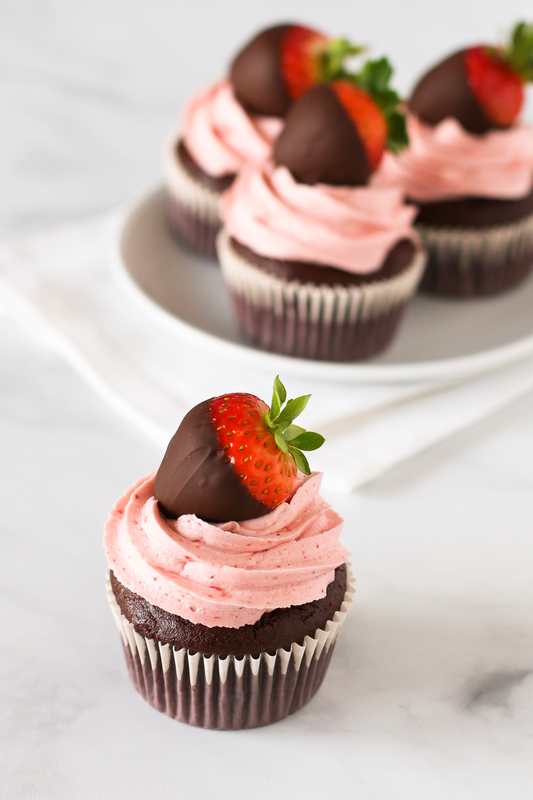 These gluten free vegan chocolate covered strawberry cupcakes are almost too pretty to eat! Making holidays special for my family is something I love to do. Whether it’s Christmas, their birthdays, Valentine’s Day, Easter or even the last day of school. I always enjoy a reason to celebrate and to make them feel loved. That pretty much always includes some type of celebratory dessert. My go-to is almost always CUPCAKES!! 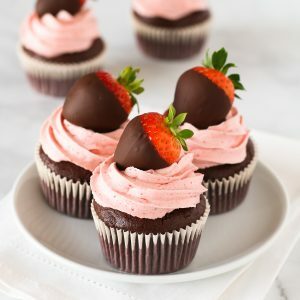 When it comes to these cupcakes, I would definitely eat the chocolate covered strawberry first. I have no self-control, especially when it comes to anything covered in chocolate. How about you? Which would you eat first? Either way, they are both delicious so you really can’t go wrong. Whenever I’m making any of my gluten free vegan chocolate treats, I always go for Enjoy Life allergen free chocolate. It’s the safest and by far the best tasting. They have their dark chocolate morsels, semi-sweet mini chocolate chips, semi-sweet mega chunks and their chocolate bars. So if you are in need of chocolate for baking or chocolate for snacking, they have you covered! Most of their allergen free chocolate is available in retail stores. If you are not sure where to find Enjoy Life products in your area, be sure to check out their store locator. You can also click here for an Enjoy Life coupon. I’m so excited for you guys to give these gluten free vegan chocolate covered strawberry cupcakes a try! The perfectly moist chocolate cupcake is topped with the fluffiest strawberry dairy free buttercream. The two together is just a match made in heaven. The star of the show is that irresistible chocolate covered strawberry on top. So simple, yet so stunning. I know how good these cupcakes are and I want you to experience their deliciousness too! Preheat oven to 350 degrees. Line cupcake pan with paper liners. Set aside. In large mixing bowl, combine flour, cocoa powder, sugar, brown sugar, baking powder, baking soda and salt. Whisk together and set aside. Stir together non-dairy milk, water, oil, vinegar and vanilla is separate bowl. Add to flour mixture. Stir cupcake batter until combined and smooth. Divide batter evenly into prepared cupcake pan. Bake cupcakes 20-22 minutes, until baked through. Place on cooling rack to cool completely. While cupcakes are cooling, make the chocolate covered strawberries. Place mini chocolate chips in a microwave-safe bowl. Microwave on medium heat for 30 seconds. Stir and repeat in 15 second intervals, until chocolate chips are completely melted. Line baking sheet with parchment paper. Dip strawberries into melted chocolate, tapping off excess. Place on parchment paper. Repeat with remaining strawberries. 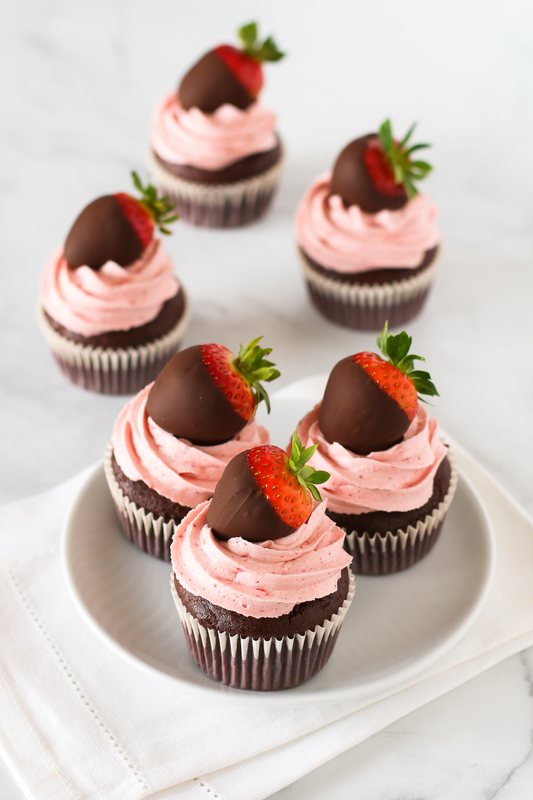 Place strawberries in refrigerator, until chocolate is set and ready to place on cupcakes. To make strawberry buttercream, place shortening in bowl of stand mixer and beat for 1 minute. Measure out 3 tablespoons of ground freeze-dried strawberries and add to mixer. Add powdered sugar, non-dairy milk and vanilla. Beat until light and fluffy, 2-3 minutes. Add additional non-dairy milk if needed. Place buttercream in pastry bag with large star tip. Pipe buttercream onto cooled cupcakes and top with chocolate covered strawberries. 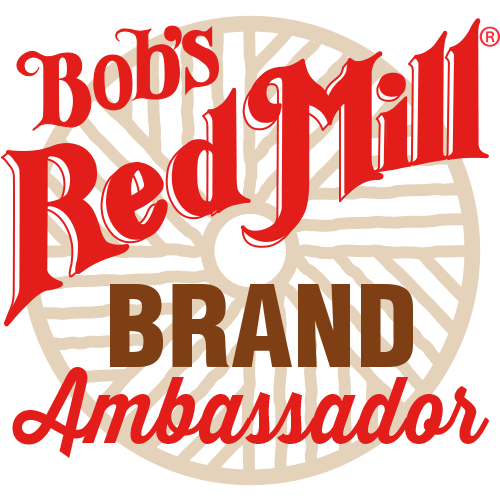 *Bob’s Red Mill gluten free 1-to1 baking flour works great in this recipe as well! **To grind freeze-dried strawberries, place in blender or food processor. Blend on high until strawberries are ground into a powder. 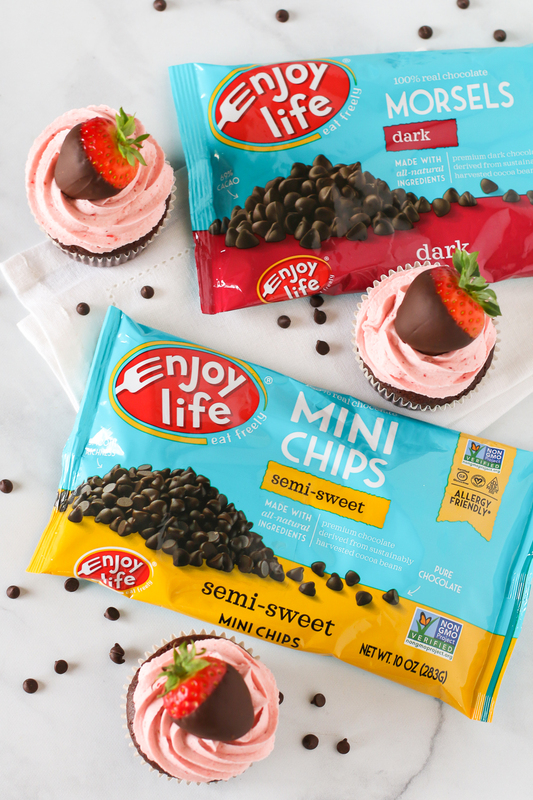 Just in time for Valentine’s Day, Enjoy Life has released these ADORABLE Valentine’s chocolate minis!! Seriously, so cute. They come in 3 flavors: ricemilk, dark and ricemilk crunch. My favorite is the ricemilk crunch. It tastes just like a crunch bar, the way I remember it when I was a kid. 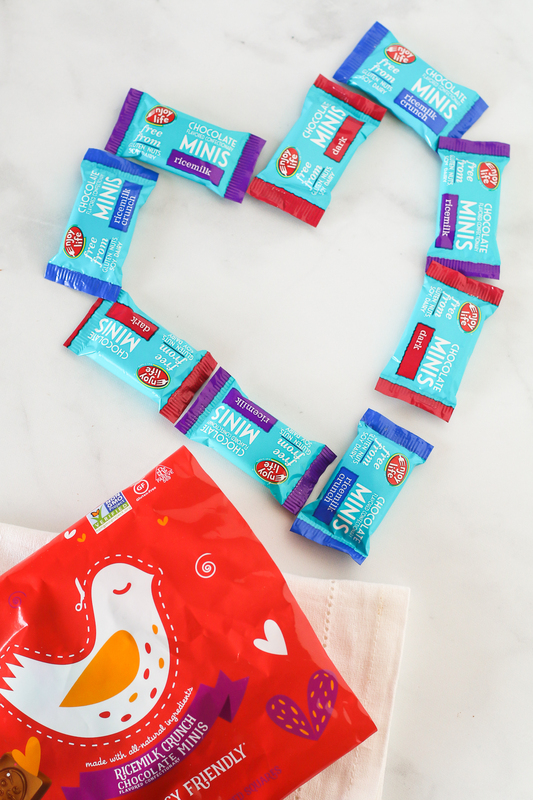 You can also get the Valentine’s minis in a variety pack so you don’t have to choose just one. For a cute treat to pass out at school, attach one of these chocolate minis to your Valentine cards. They are not only delicious, but they are allergy friendly too! This post was sponsored by Enjoy Life. All opinions and recipe are my own. This post contains affiliate links. If you purchase items through some of the links, I earn a small commission off the sale at no extra cost to you. Helps keeps the recipes coming and the blog up and running!